Did Rep. Alexandria Ocasio-Cortez's State of the Union Outfit Cost Thousands of Dollars? - Truth or Fiction? The congresswoman’s all-white attire became the subject of memes implying that she was wearing expensive designer pieces. Rep. Alexandria Ocasio-Cortez's white State of the Union attire cost around $7,600. In February 2019, Rep. Alexandria Ocasio Cortez was among a number of Democratic women wearing all white ensembles for the president’s State of the Union address, and the New York congresswoman’s outfit in particular inspired a number of memes. 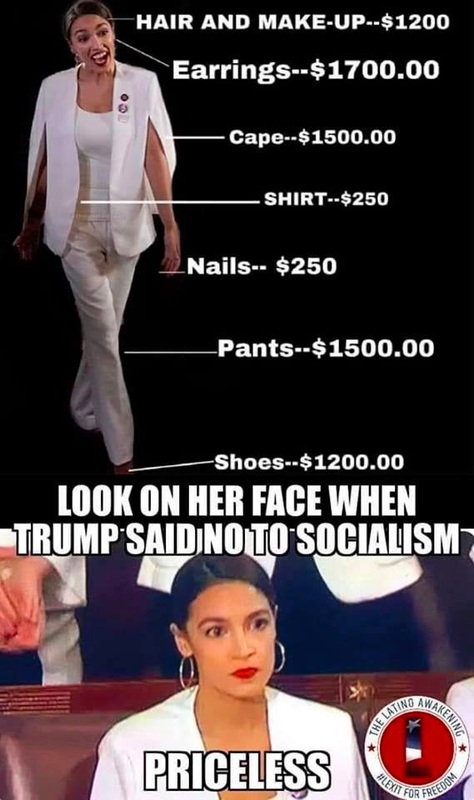 Early versions of this meme only included the supposed cost breakdown of Ocasio-Cortez’s attire, but subsequent versions hammered the subtle point home by tacking on the “priceless” comment. 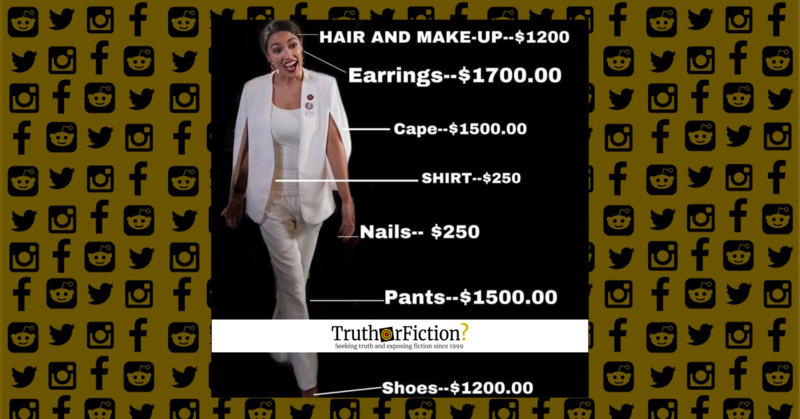 According to the meme, the total cost for her ensemble (including hair, makeup, earrings, a cape, a top, pants, nails, and shoes) added up to $7,600. So much for SOCIALISM. Who GAVE her this? Remember, she was TOO POOR to afford an apartment when she moved to Washington, DC. Events like State of the Union addresses and virally popular ensembles like Ocasio Cortez’s are often covered in fashion publications in the day or days after the event. It’s also not uncommon for designers to loan pieces for events, with publicity serving as compensation for the arrangement. Nevertheless, we were unable to find any designer definitively claiming credit for the widely-discussed ensemble. Several publications attempted to track down the exact pieces, primarily the cape portion of the outfit. Both Heavy.com and Insider attempted to locate a precise match, the former noting that an “unconfirmed” match was the “ZARA White Flowing Cut Cape Jacket Blazer,” retailing for $89.90 in February 2019, a far cry from the $1,500 claim in the meme. Fashion magazine InStyle suggested a similar BCBG garment as possibly a match for the cape, but even that slightly more expensive item retailed for $228 — again, a far cry from $1,500. Additional items cited in the meme (such as her pants, top, and shoes) received little to no fashion-based coverage, and were presumably based on nothing more than the wild, random guesses from whomever made the memes. Next time someone tells Bronx girls to take off their hoops, they can just say they’re dressing like a Congresswoman. Fashion coverage at the time did not extend to the cost of her earrings, but there’s no evidence anywhere that they clocked in at $1,700. There was also no evidence that Ocasio-Cortez paid any professionals to do her nails, hair, and makeup. However, assuming she did have all those done for the State of the Union address, the closest cost estimates we could locate were national averages on the service aggregation site Thumbtack. If we selected the top end of national averages for each service, it came out to $200 for hair. Thumbtack didn’t have similar cost estimates for nails, but a similar site estimated the very highest end of nail services (pink and white acrylics at a resort hotel) as $85.00, not $250.00. Similarly, makeup application on Thumbtack ranged up to $200.00. The combined highest estimate for hair ($200) and makeup ($200) came out to $400, not $1,200, which by any reasonable estimate is beyond wildly inflated. Assuming Ocasio-Cortez not only obtained said services for the event, but paid top dollar for them, the cost for all three topped out at $485 (assuming the most expensive services available in their top range). That cost according to the meme was $1,450, a difference of roughly $1,000. Rep. Alexandria Ocasio-Cortez has words for people angry about her face during the State of the Union. Is Chuck E. Cheese’s Pizza Recycled? Did Alexandria Ocasio-Cortez Say Her Girl Scout Troop Recreated the Challenger Launch?